For the person who dreams of walking the English countryside. A Foot Trail is a custom-made English walking experience. Our multi award winning Foot Trail trips enable you to explore over 1000 miles of English countryside through South West England, in Wiltshire, Dorset, Somerset, The Cotswolds, Bath and Avon and Devon. Our trails have featured in highly regarded travel publications including Lonely Planet, National Geographic Traveller, The Los Angeles Times, The Times (UK) and Country Living Magazine to name a few. 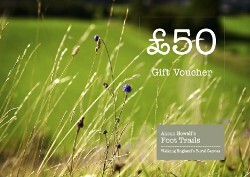 Available as gift vouchers (your friend or family member can then choose any independent Foot Trails walking holiday) or buy an entire Foot Trails experience via our gift certificates. We will be delighted to help advise on the best walking trip options for you. Gift Vouchers are valid for two years. Available from £25. Gift vouchers include complimentary card ( 100% recycled card) and envelope and posted FREE to any UK address. Your order will be dispatched within 24 – 48 hours. 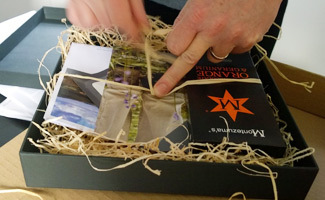 Our craft feel square gift boxes include your choice of gift vouchers, a bar of British chocolate (100g) and gift card. We hand tie your box with ribbon. Gift boxes are complimentary for gift orders over £400. Alternatively purchase for just £11.95** inclusive of first class UK postage. 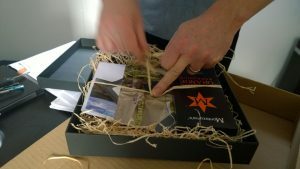 We can post outside the UK and send your gift by special delivery. Please contact us directly to arrange. To shop for gift voucher orders up to the value of £400 to be posted to the UK simply click ‘Add to Cart’ for your chosen amount plus the gift box (if you would like one) then click ‘View Cart’ to checkout using Paypal to pay. 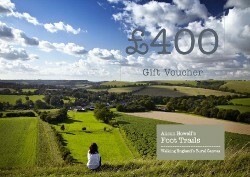 If you live outside of the UK or wish to purchase gift vouchers over £400 please call our friendly team directly to arrange on +44 (0) 1747 820 626 or email your request to enquire@foottrails.co.uk.